To say that the last few weeks in December have been hectic is truly an understatement. I finished my COMM 505 class by the skin of my teeth (Dec. 18th we wrapped up), I moved physically to a new office space (Dec. 19 & 20th) but on December 21, none of that mattered as I headed back to Saskatchewan for the holidays. Christmas was different this year and I can't quite put my finger on what made it so. There was just so much going on that quiet time with friends and family was appreciated so much more. Thank you to my wonderful family who always welcome me home with open arms no matter how long I've been away or how short my stay may be. You have always been there for me and it is YOU that I love spending the holidays with. All the best everyone for a lovely holiday season and wishing you so much happiness, health and success in 2012. Santa brought me a new bike! The holiday hijinx continued last night as I was MC for my own work Christmas party. Each year the Wellness Committee within my faculty plans a great final wind-up for professors, students and staff before we all disperse for the holidays. There was trivia, there was Christmas carol-oke (public health themed, of course) and delicious, nummy food. Many of our students have finished their studies and will be leaving the faculty forever which means it's always a bit bitter-sweet for me but I wish them all the best with their future endeavours. It was an evening to remember ~ Christmas at the Harper / Lauder residence. We trimmed the tree, we decorated the house and we opened our doors to our friends for an evening of food, drink, laughter and music. Thank you friends for making 2011 an amazing year. So happy to have you all together in one place for a night. I look forward to what 2012 will bring for all of us. Yesterday I got to meet my new nephew. My friends Mike and Angie welcomed baby Beck Everett into the world three weeks early at the end of October. This was the first time I got to meet him. I so can't wait to watch him grow. We can watch Roughrider and Oilers games together (you've even got the gear buddy)! Best of all I love to see his mommy and daddy so happy (great work Mike and Angie ~ he's perfect). This past weekend saw me back down in Calgary to celebrate another favourite girl's birthday. Happy birthday Paisley (the number will always remain secret)!! I'm so happy to count you as a friend, you're an amazing listener, fantastic adventurer and true kindred spirit. May this upcoming year bring you much change but for the better! what Remembrance Day is all about. I remember my grandparents who grew up in the middle of the two terrible wars. I remember how it felt to stand on the edge of the de-militarized zone that splits North and South Korea. Remembrance Day still reminds us all of how things were not always so easy. On the morning of November 11, the prairie sunrise reminded me of all the freedom we enjoy thanks to those who served and still do. Thank you to the brave men and women who serve our country. This post is inspired by my readings this week in my master's program and a thoughtful conversation I had last night with @matt_bisson. This week we had to digest the theory of Marshall McLuhan - of "the medium is the message" fame. Our class has talked a lot about electronic media and how it's changed our society. Last night Matthew and I started talking about how more and more people are taking time during their work day to surf Facebook, Twitter and YouTube. He mentioned that studies were showing people need that time to disconnect from work, let the mind roam free and then they can return to the task at hand refreshed and ready to go. What Matthew was saying makes sense to me, and it also made me think of YouTube'ing becoming the new coffee break for the new generation. Instead of taking 15 minutes away from the desk to go for a coffee with co-workers, are we now switching the rules by surfing the Net instead? I'll leave you all with this - my MACT classmate @CarolynFreed did a YouTube mash-up for our readings this week. I find it hilarious! I would definitely take time out of my work day to watch this. Last night I was able to watch the Saskatchewan Roughriders cap off their season in Edmonton. We haven't had the best season ~ finishing with a disappointing 5 wins and 13 losses. This coming from a team that has made the playoffs every year for nearly 10 years. No matter, I've stuck by them all season long and last night I wasn't disappointed. Many thanks to my Twitter friend @rbfleming for giving me a ticket to last night's game. It was a chilly -6 Celsius at kick-off and I was wearing enough layers to make me feel like the abominable snowman. While we had already lost out of the playoffs the Riders played the game last night like they were still in contention ~ making the Eskimos work hard for the win. When it was all said and done Edmonton walked away with 23 points, we walked away with 20. Thank you boys for a great run this season, and while some "fans" may have been disappointed I never was. Enjoy the off-season you've all worked so hard. I look forward to seeing you play again in 2012! I've been pondering this for quite a while, the concept of what makes a 'real' person. Of course you exist in the physical and lately, online, sense. But there's more to just physically occupying space in the world. Real people are those genuine souls who are the same person from work to play, from online to face-to-face. People who don't misrepresent who they are and what they like. Folks who know who they are inside and out and embrace it. Someone who says something and you know you can take them (and keep them) at their word. I spent quite a few years growing up and then in certain relationships trying to be what I thought the other person wanted from me and I realized that inevitably I always end up unhappy. So a few years ago I decided to just be ME and love all of the quirks that make me different than others. I've found it's connected me with a lot of people who are like minded as me. Thank you friends for liking me for who I am and for not trying to change me. So now I ask you: Are you a 'real' person? A little late with this post but here goes anyway! Last weekend was Thanksgiving in Canada and as usual I headed home to Saskatchewan to spend some time with my family. I am truly thankful for them because over the years as we've grown up, grown old, grown apart we still manage to be the same loving people that we all started out as. I've spent a lot of time away from these amazing people and away from my home province and it just makes me miss them and love them more. Thank you family for the wonderful values you've instilled in me, for the ambition I'm blessed with and for the support with each new challenge I tackle. My furry little friend (Sassy) enjoying some sun! ...and I've been feeling really guilty about it. Friends it's kind of sad when you don't even have time to write about all the great things you've been working on, the epiphanies you've been having and the things that put a smile on your face. Between work, my studies and full-time volunteering it's a scramble to fit in a proper sleep but I'll try to chime in more often. As always, got some bloggy inspiration from a friend that I've never met but she has changed my life with her daily views on the world (thank you Lou Lou)! I want to say thank you to all of you friends who stick with my random thoughts and not-so-adventures. You're the best friends ever! It's birthdays galore for my girlfriends and next in line was my bestie Courtney (aka Miss Meow). She's just one of the loveliest lights you could ever find in the world and I'm so happy that we've become friends (after she used to make me cry when we worked together at Starbucks). I'm so blessed to have friends like you and to be able to celebrate milestones like these. Well technically it's fall here but you really couldn't tell this weekend. With temperatures that topped +32 over Saturday and Sunday here in Edmonton it was really hard to keep my nose to the school grindstone. So instead of keeping my mind occupied with my master's studies I got out and experienced some sunshine and heat! 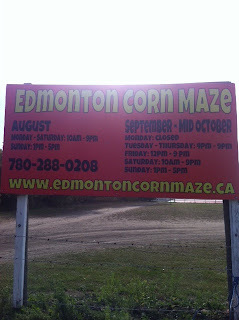 In particular, I made up my mind to revisit the Edmonton Corn Maze ~ and this time I brought my friend Nicole. See Nicole is deathly afraid of corn mazes; she was truly worried today that we would be lost in the field and never find our way out. I wanted to help her overcome her fear - plus I had ulterior motives. 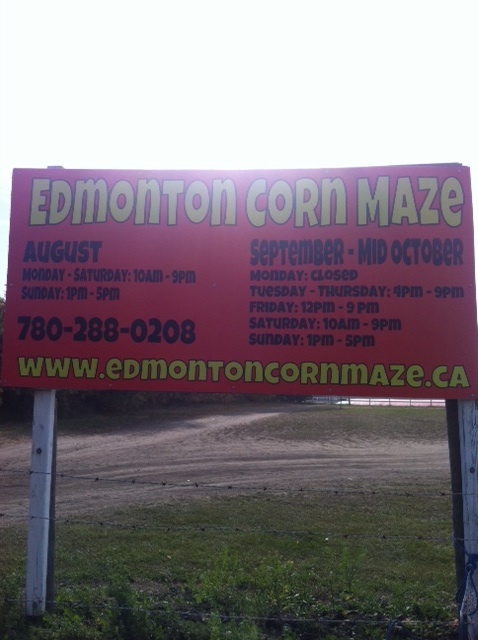 This year the corn maze was cut in the shape of the IIHF World Junior Hockey Championships logo. The hockey tournament will be hosted in Alberta this winter between the cities of Calgary and Edmonton. I am currently volunteering for Hockey Canada along with Nicole on their social media team trying to get fans engaged long before the tournament. I'm on a permanent rotation to manage the @hc_wjc Twitter handle and for the last two weeks I've been working on fan engagement, my style! 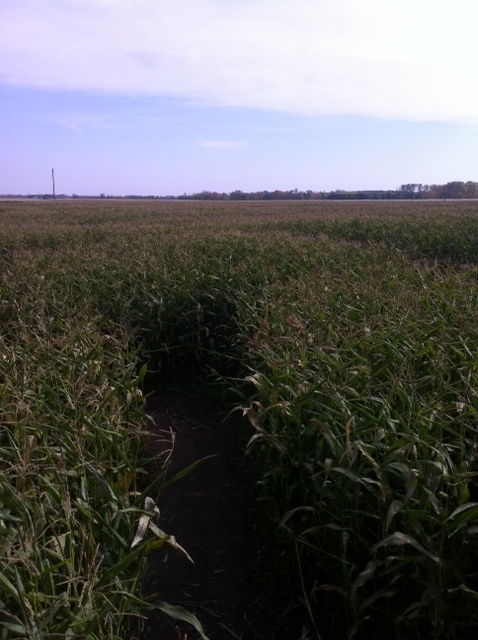 So what better way to get Twitter followers involved then by taking them to the corn maze with us today?! Nicole and I had an absolute blast getting lost and finding our way over and over. I think I've helped ease Nicole's fears while we got out for some sunshine and exercise plus our Twitter fans loved being involved in our little escapade. No matter how busy it seems to get in my life I'm happy for moments like today when work, play and friendship can all come together! The last couple of Labour Day long weekends I've been away for weddings or for camping trips but this year I decided to go home to Saskatchewan for the weekend. We decided to celebrate my father's 60th birthday while I was home (his actual birthday is Sept. 9th) and I'm so glad we were able to get the family together. We celebrated with a corn roast in the backyard, toasting to dad's health and happiness. Thanks for letting us share your birthday with you! And while we celebrated with great weather, harvest was getting underway. Swathing, combining, and spraying fields ~ all the farmers around (us included) were busy out in the fields literally trying to 'make hay while the sun shines'. This truly is my favourite time of year ~ I love the yeasty smell of the crops in the fields and the shine of the equipment lights in the fields late at night. No matter where I live or how often I move away, Saskatchewan keeps calling me home. Someday I want to be living back in the "Land of the Living Skies".